Monitors tend to be pretty well vented. Give that heat may affect random clickage it might be worth trying to get some airflow. good point Drewid, I guess it can't harm to put a small fan in. Today's job was to sort out the cable that goes from the lcd to the controller. 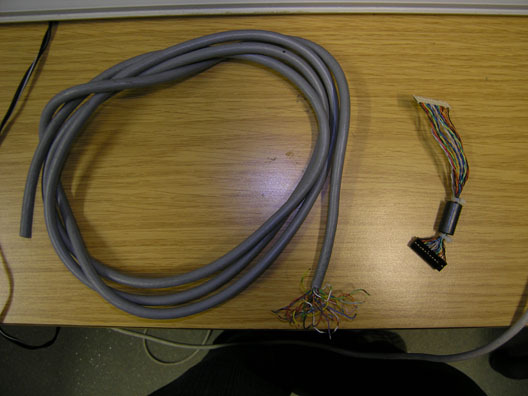 I managed to get hold of a bit of scrap 30 core wire which had cores that matched the lcd cable wires. 3 hours later 10 hand twisted pairs and 3 stray wires, 46 joins and insulation. I'd made the cable 15cm longer which is enough to go over the top of the tablet and down the back. And it works! Was able to test the lcd screen for the first time since I took it apart . with any luck the ffc cable will arrive this week. P.S. I have a couple of feet of the 30 cable left. If anyone wants some I don't mind mailing it out for free. Thats some serious wire extensioning. Kudos to Yudos!